What Once Stood On The Vacant Acres In Milwaukee's Harbor? The red outline marks the location of the former Milwaukee Solvay Coke & Gas site. Courtesy of Tetra Tech EM Inc.
Milwaukee Solvay Coke & Gas Plant in the 1930s. Crew rebricks a coke oven. Abandoned Solvay building. Photo taken around 2005. Abandoned Solvay building in 2014. Some of the 14-acre parcel in 2017. A bankruptcy judge Tuesday approved the sale of the former Milwaukee Solvay Coke & Gas Company site to Wisconsin Gas LLC, a We Energies affiliate. It was the only bidder, offering $4 million for the 47-acre parcel. We Energies is among several businesses that are responsible for the site's environmental cleanup. The utility used to operate a gas works there years ago. Before previous owner Golden Marina filed for bankruptcy, it had hoped to create housing and a marina there. A We Energies spokesperson says the company anticipates to close on the sale in early May. For this week's Bubbler Talk, we look into a question submitted by Scott Wimer, who asked: What used to be located on the land south of Greenfield Ave., west of the Kinnickinnic River and east of the old Chicago/Northwestern tracks? 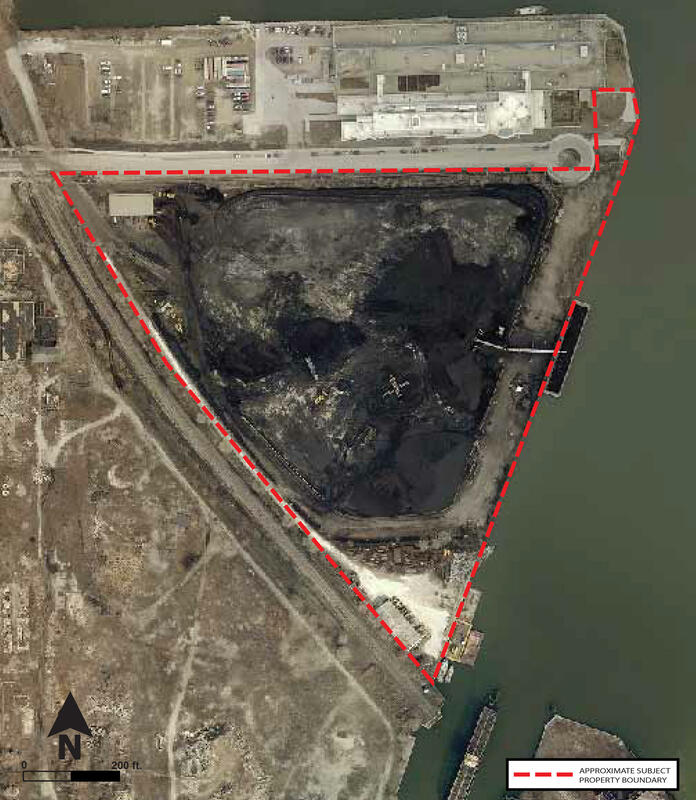 Perhaps you'd recognize that big, vacant plot (actually it's two distinct parcels) in the Milwaukee Harbor as formerly holding gigantic coal piles and dilapidated buildings. Although WUWM's Susan Bence wasn't able to connect with Scott (Scott, where are you? ), she did meet up with two people in the know at UWM's School of Freshwater Sciences. It overlooks the harbor as well as the two parcels of property in question. Larry Sullivan, the Port of Milwaukee's chief engineer, has seen many changes to this area - he's been with the Port for more than 50 years. Aerial view of the 14-acre parcel. "There was a U.S. Coast Guard lifesaving station back in the corner and, for a number of years, that's where they would launch boats to try to rescue people," Sullivan adds. Dave Misky, who works for the Milwaukee Redevelopment Authority, says harbor activity along Greenfield Avenue stretches back to the 1800s. "There used to be a tank farm on the property. These were large, 50,000-gallon tanks that stored fuel. They were brought in on ships and distributed via rail or truck," Misky explains. Photo of Solvay's administration building taken around 2005, years after Solvay closed. The neighboring and much bigger chunk of property - 44 acres, experienced a parade of industrial use, from leather tanning to furnace companies. But people might recognize the land as being occupied by the Solvay Coke & Gas Company's buildings and manufacturing plant. 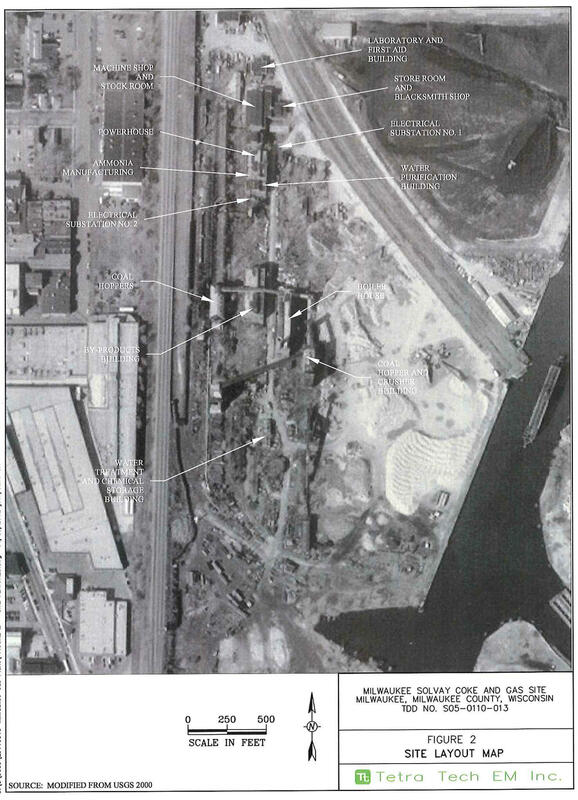 Aerial view of the Solvay Coke & Gas Company 44-acre parcel. This image was taken prior to 2016, when the land was cleared. 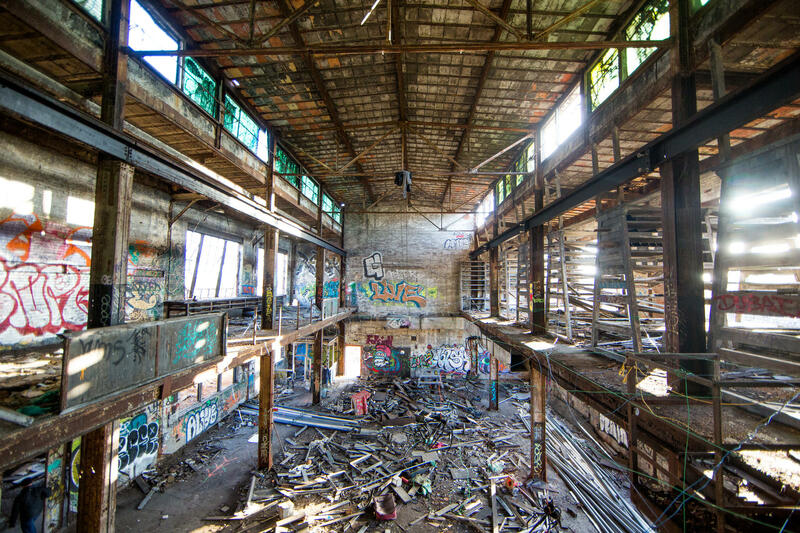 Credit Tetra Tech EM Inc.
Solvay ceased production of gas and coke in the 1980s, but its graffiti-adorned buildings didn't come down until 2016, and not without careful oversight of the removal of its hazardous waste. The Solvay site has been an EPA Superfund site. Port Engineer Larry Sullivan looks at the land with a glass half-full attitude. "It's full seaway draft - 27 feet, ("draft" referring to the depth of a ship's hull below the waterline), and it has a dock wall that the city has put a lot of money into that will take ships right up next to the wall. So its a unique area where you can handle deep-draft vessels." Right now, Milwaukee is accepting proposals for the 14 acres the city owns. "We are hoping we can find a mixed-use that works for everybody, that takes advantage of that unique site," Sullivan says. As for the larger, 44-acre former Solvay parcel, it is on the auction block. UWM Architecture Professor Jim Wasley has been dreaming about the property's potential for years. He has even had his students formulate visions of the harbor's commercial and ecological restoration. "The big vision we ended up settling on, and have developed through subsequent studio, [is that] people want the harbor to be publicly accessible," he says. "There should be a public harbor walk. People want the harbor to be densely developed economically, an engine for this neighborhood and successful. So, there's a certain amount of density that's needed. As we see all over the world, harbors are being redeveloped." And, to our question-asker Scott, wherever you are - we hope this quenches your curiosity. Before the empty Solvay buildings were demolished, the site was a popular area for graffiti and photography. This image was taken in 2014. What Happened to Milwaukee's Signature Yeast Smell? Anyone who grew up in Milwaukee or who lived here before 2005 may remember a pungent yeast smell in the Menomonee Valley, around I-94. For this week’s Bubbler Talk, we visit the Pryor Avenue Iron Well in Bay View. Listener Lisa asked: What can you tell me about the Bay View Spring on Pryor Avenue? Why and how did it start? It's still running; do people still drink from it? Built in 1882, the Pryor Avenue Iron Well is the only one that remains in the entire city of Milwaukee. In Bay View alone, there used to be six wells throughout the neighborhood for residents to use. What's Going On With The Grand Avenue Mall's Transformation? This week’s Bubbler Talk question comes from Jeanne Pehoski, who wanted to know: When is the Grand Avenue going to be a go-to destination again and get some viable anchor stores and better offerings in the food court? I met Jeanne at the mall in the heart of downtown Milwaukee, where she shops a couple times a month. She says she visits TJ Maxx and Walgreens - a couple of the stores that have survived for years.